GST slab rate is recently finalized by GST Council. It seems the India is moving one step ahead towards implementation of GST a common tax for goods and services. The GST will be a game changer for the Indian economy as it will abolish many indirect taxes and bring all of them in the single window. GST will also remove the interstate barrier for trading in goods and services. However, looking at GST slab rate it will bring inflation for the common man. It is anticipated that GST will be implemented from 1st April, 2017. Let’s take a look at GST Slab rate and its impact on common man like you and me. As per present agreement GST will be implemented in 4 slabs from 5% to 28%. GST shall cover each and every product and services sold and offered in India. Under 0% Tax Rate – All commodity items such as food grains, rice, wheat and item comprising of 50% consumer price index will fall under this slab. GST 1st Slab 5% Tax – All mass consumption items such as spices, tea, mustard oil will fall under this tax slab. 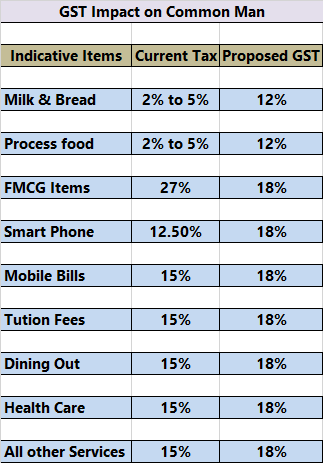 GST 2nd Slab 12% Tax – Process food items such as bread, cheese, readymade meals, milk will fall under this tax slab. GST 3rd Slab 18% Tax – Under this tax slab item such as soaps, oil, toothpaste, refrigerator and smartphone is included. GST 4th Slab 28% Tax – This tax slab will include luxury goods, luxury cars, tobacco products, pan masala and aerated drinks etc. There will be additional cess and clean energy cess on the top of the highest tax rate. In addition to above tax slabs, service tax rate will go up by 3%. The new service tax rate will be 18%. The goods widely used by middle-class people such as toothpaste, soaps, oil which are taxed currently with 27% will be brought down to 18% slab. Process food items which are essential for the survival of poor men such as bread and milk will be taxed @ 12% post implementation of GST. Tobacco products, pan masala and aerated drinks will be costlier as it falls under highest tax slab. One needs to pay additional cess on these items. All services will be costlier as new service tax rate post GST will be 18% compare to the current applicable rate of 15%. So, you need to pay more money for telephone, mobile bill, food bill, car maintenance, courier services. Do share your views on the GST Slab rate! Do you think GST will be beneficial to the common man?